At the time, I couldn't go back to Windows Vista and I didn't ask my in-law for help. So I hunkered down and started learning. But I was scared of other Linux distributions and felt lucky that I could even get Ubuntu on my computer. I started to learn how to make my newly installed system look and feel how I wanted it to. For a year or so, I executed shell scripts with reckless abandon, as root, which downloaded icons and possibly zero-day exploits. GNOME-Look was a staple source for me. I had fun learning about all the free software that one could get through Ubuntu's software center and Synaptic. To be frank, I only cared that it was gratis. I was a kid and could not afford much of anything. But, the fact that a lot of software was free as in beer got me thinking and made me wonder why. I researched and learned of the alternate paradigm around "free software." I was amazed that people can actually improve programs and get features that aren't available on closed platforms and from closed tools. This was the moment that completely changed my thinking about open source. I loved learning that if I knew coding I could add improvements to an application that I loved. I could create a plugin or better interface and share it with the rest of the world. I was free to do this, and had no limitations but my own. This feeling was like stepping into an abyss of pure joy, awe, and endless excitement. I knew that it would take time for me to learn programming, but I wanted to start giving back to the community as soon as possible. I started small and ended up doing a lot of tutorial videos on YouTube. My early videos talked about GnoMenu, the best no-longer-working menu ever, and tricks on fixing Flash exiting full-screen on multi-monitors. I participated in IRC channels, learning about and advising others on fixing random problems. I started to think about how things worked. I thought about what lesser elements were needed to compose the larger parts of programs. I learned how to research my problems and fix them; if there was nothing online, I tackled it alone. 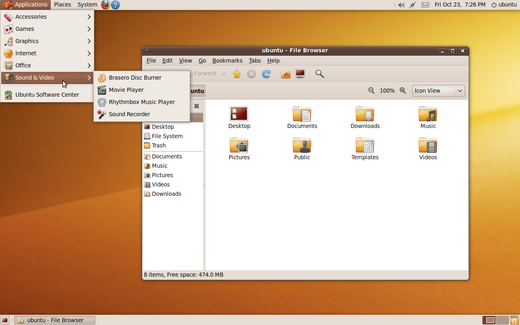 Then when the Unity desktop environment was released, I looked to new Linux pastures. During this period, I experimented with many distros, including: Puppy Linux, Vector Linux, CentOS, and Mint. None of these held my heart for long. I was restless and hungry to experience what was out there. As I tried out distributions, I didn't find the one that fits me best. Necessity is the mother of all inventions, and so I concluded that I would create my own distribution. By then I was comfy with aptitude and apt-get, and other terminal commands like ls, wget, cd, and many others. So, I did what every guru does and learned how to use Bash and make scripts. Those scripts did anything that I wanted them to do, everything from automated backups to creating HTML files from entire directories. With my Bash skills in hand and the vast Internet for guidance, I used a great program called Ubuntu-Builder that set up everything and dropped it into a chrooted environment. Using my scripting-fu, I set out to create Sol-OS. This process expanded my knowledge of how Ubuntu, Arch, and other systems functioned. It also gave me great confidence in knowing that I could tackle any problem that came my way. Additionally, it was great material for tutorial videos to give back to the community. I was successful in my endeavors and released my first version of Sol-OS based on Ubuntu 13.04. Time moves on, and I am now 23 and in college getting a Bachelor's degree with a focus in Computer Science and Communications. I am improving my skills in C++ and Java rapidly, and am now releasing small programs (FXWinWrap, Distro-Builder, Shellmen) that others may use on their systems. Sol-OS is still a part of my life and I am working to apply my new knowledge to it for its third release. All of this is possible because I took that first step. I am now contributing back to a community that has given me so much. I would not be here if it were not for that magical revelation of true freedom. I now look forward knowing I have come a long way, but I have much farther to go. I know that this journey will not be a lonely one and so I say, "See you Space Cowboy!" Cool history bro! Felt really identified with u. Cheers from Argentina. Thank you! I'm very happy you enjoyed it! Thank you for the kind words!! I do hope others look into building a personalized distro too. Even if they never release it to the public it is such a powerful way to learn about open source and Gnu/Linux.